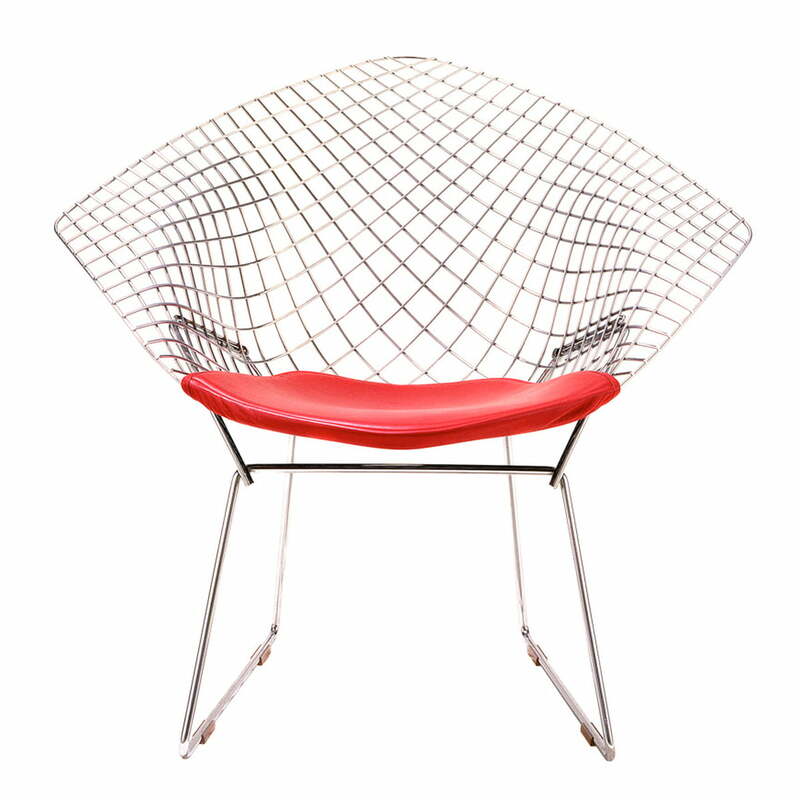 Whether chromed, satined chromed, or with plastic coating (Rilsan-protection coating), the wire mesh of the Harry Betoia designed and Knoll produced Diamond Chair served as inspiration for generations of growing young designers. 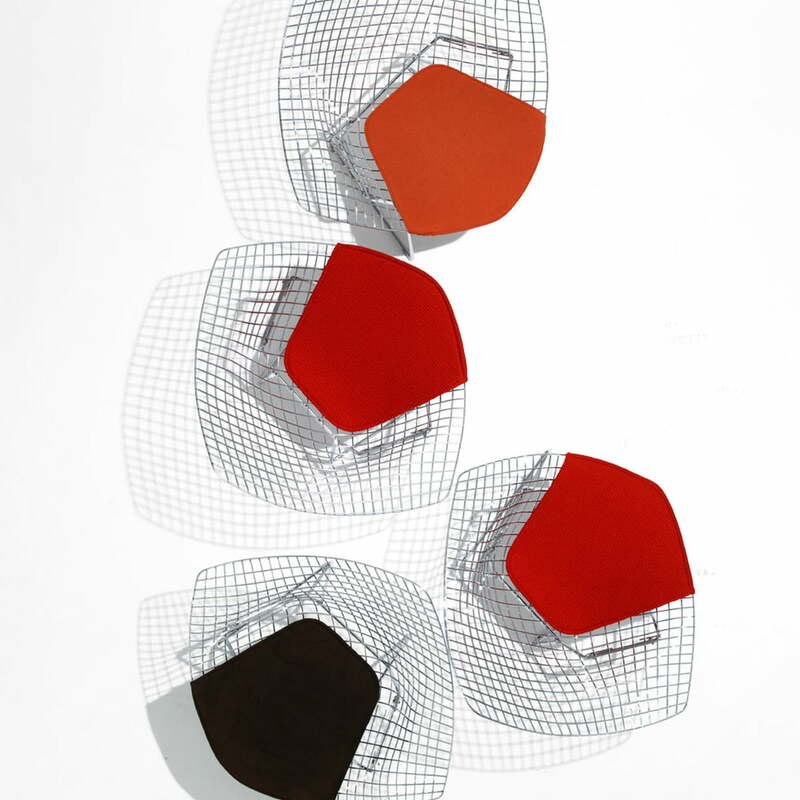 The Diamond Chair is part of a whole series of seating furniture, loungers, and stools that were designed by Harry Bertoia in the beginning of the 1950s. 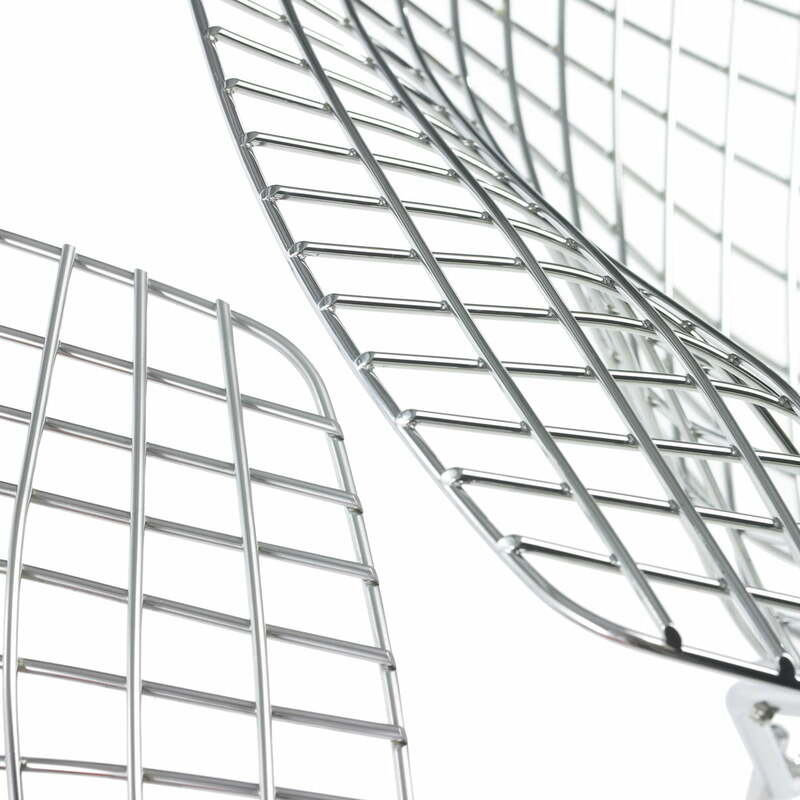 All members of this “wire frame furniture pieces” are welded by hand in a highly complicated procedure. 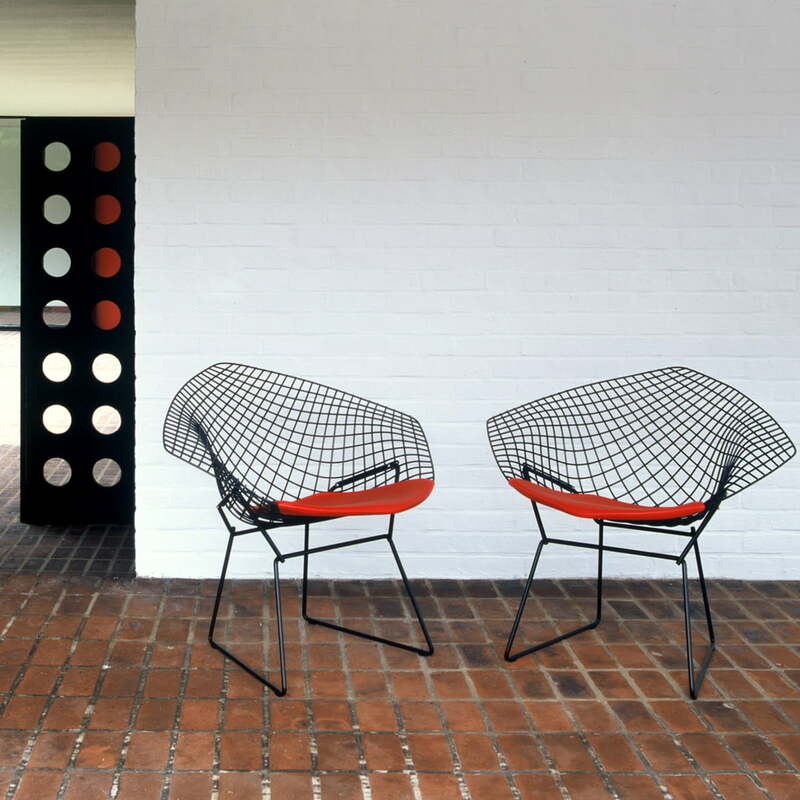 The trained sculptor and silver smith Bertoia – who saw his chairs as “studies in room, form, and metal” – placed a square on the tip and made it longer – a form game with pleasant results: The lounger is weightless and comfortable. The Diamond Chair from Bertoia has been placed in many collections of famous design museums today. It possesses a classic, modern design that enlarges every surrounding. His filigree form reminds one more of a sculpture than a lounger; however, the Diamond Chair is extremely comfortable and fulfils all practical demands of seating furniture. 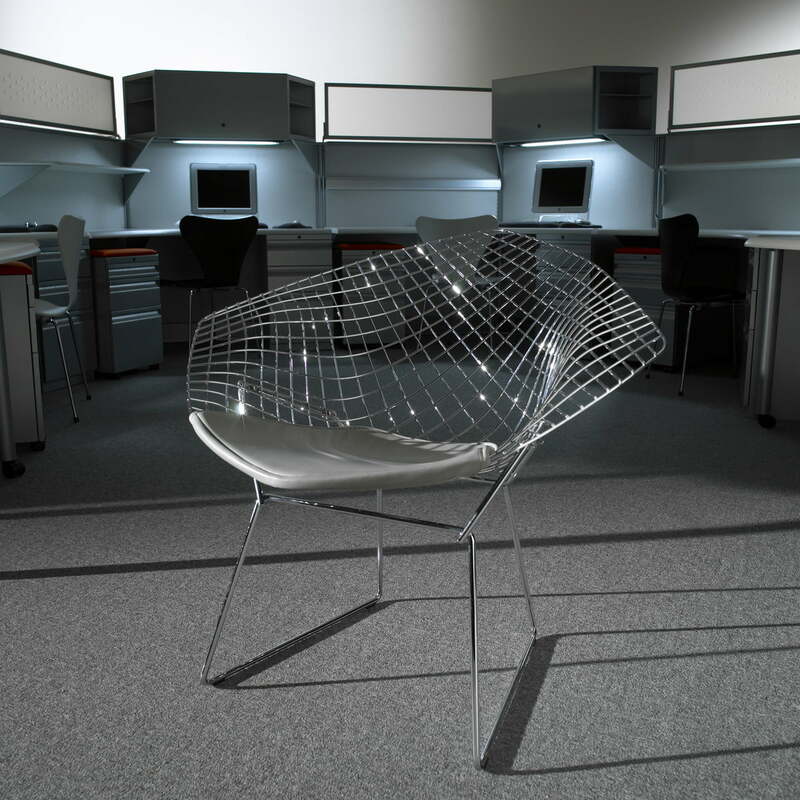 The Bertoia Diamond Lounger is and will be a fascinating study of bent round steel and an icon among seating furniture. 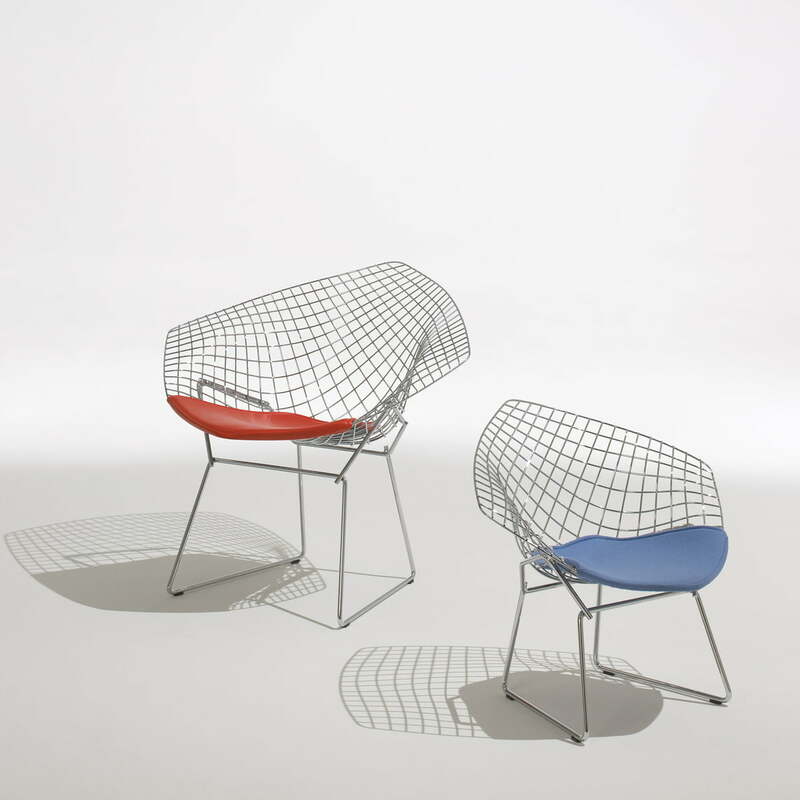 Knoll offers the Diamond chair in different editions: with or without seating cushions, completely upholstered, with chrome plated or satined chrome plated frames, as well as a frame with Rilsan-protection coating usable as outdoor furniture. Moreover, the Diamond Lounger is available in a larger version and as a smaller children’s lounger. Characteristics: a classic, modern design that enlarges every surrounding. 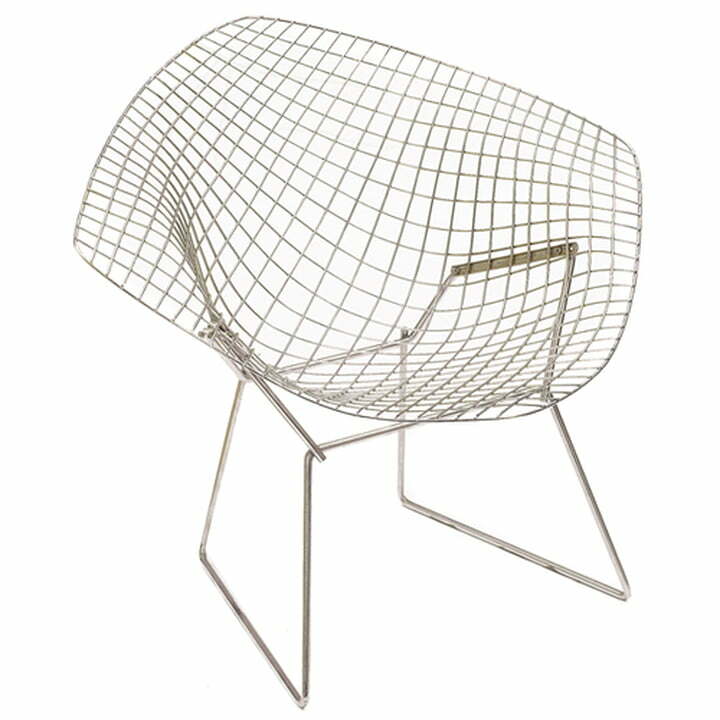 The Harry Bertoia Diamond Lounger is a fascinating study of bent round steel and an icon of the middle of the previous century. Available with whole upholstery or only with cushions. The logo “Knoll” is imprinted on the lower frame. Construction: The Diamond Lounger is available high glossy or satined chromed and with Rilsan-coating in black or white. The whole upholstery is tensed over the seating bowl and fixed with hooks. The seating cushions are fixed with latches and buttons. 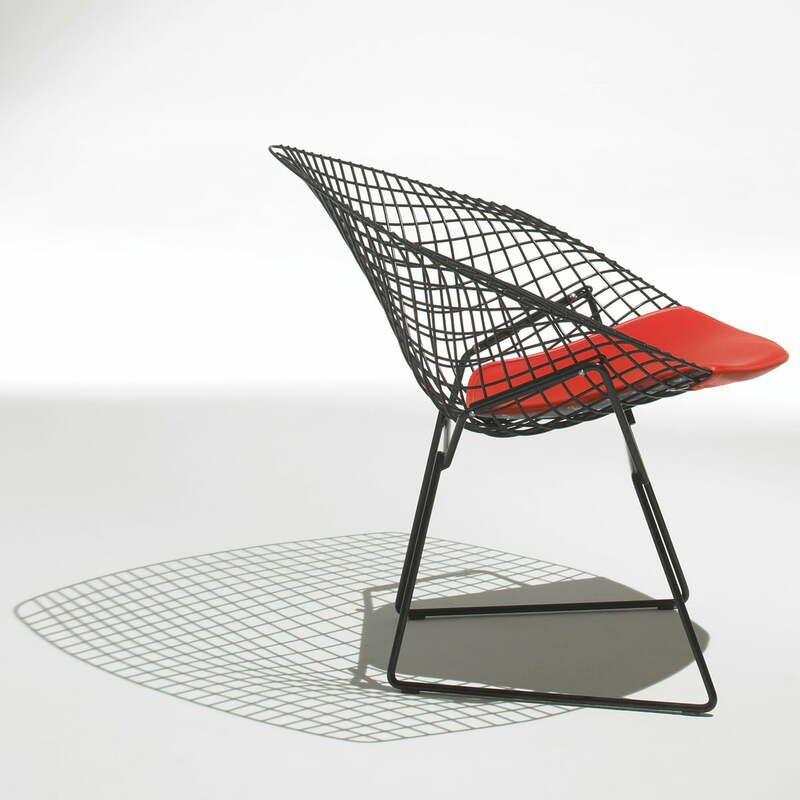 The edition without whole upholstery in Rilsan is also suitable for outdoor areas. Surface: The Diamond Lounger is available high glossy or satined chromed and with Rilsan-coating (black or white). 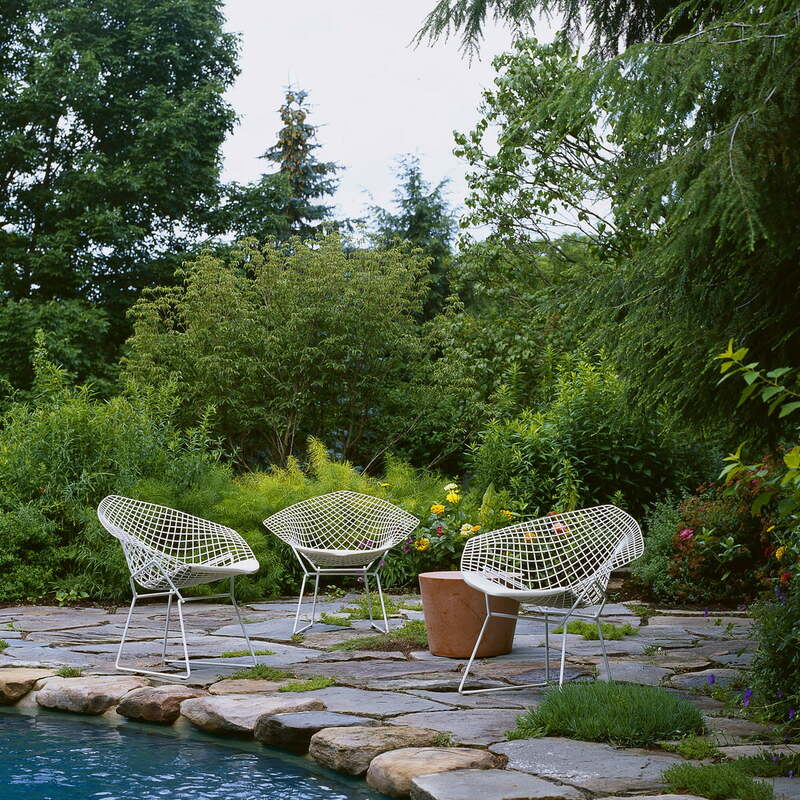 The lounger can be ordered with seating cushions or wholly upholstered.